I told Tim that I had booked us in for 6.30pm via email that morning, but that I didn’t think he should expect too much. I thought it would be regular ‘pub grub’ or ‘grills’. Anyhow when we arrived, we were really encouraged by their friendliness and efficiency. We took a seat (in a booth!) and decided there wasn’t time for a real starter, so we would merely share some hummous and pita. And I should probably mention, that I love my hummous at the best of times. The plate arrived, and after the first bite, they’d won me over. It was hands down the best hummous I had ever eaten … ever! And the pita was tasty. I generally steer clear of pita, because it often is more akin to pliable cardboard. Not this pita. We virtually licked the plate clean. I then ordered pasta. 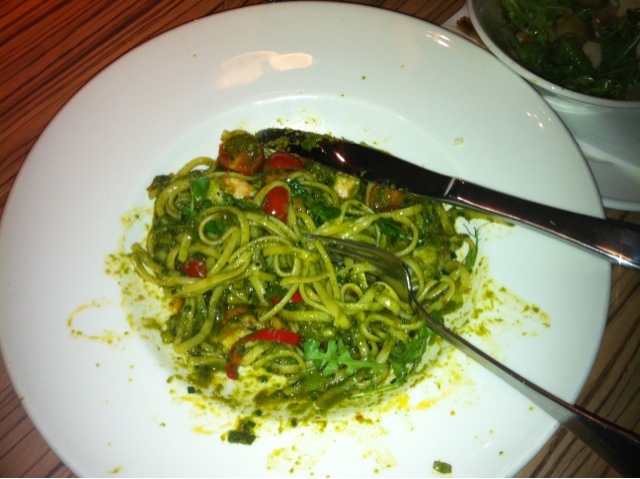 My king prawn linguini with coriander, chilli and ginger pesto was bursting with freshness and flavour. Tim was equally pleased with his fish pie. In fact, we were so impressed, before we left we booked for next week when we’re back at the Lowry to see Rhod Gilbert. I think Lime will always be our restaurant of choice when we’re in Salford Quays from now onwards.